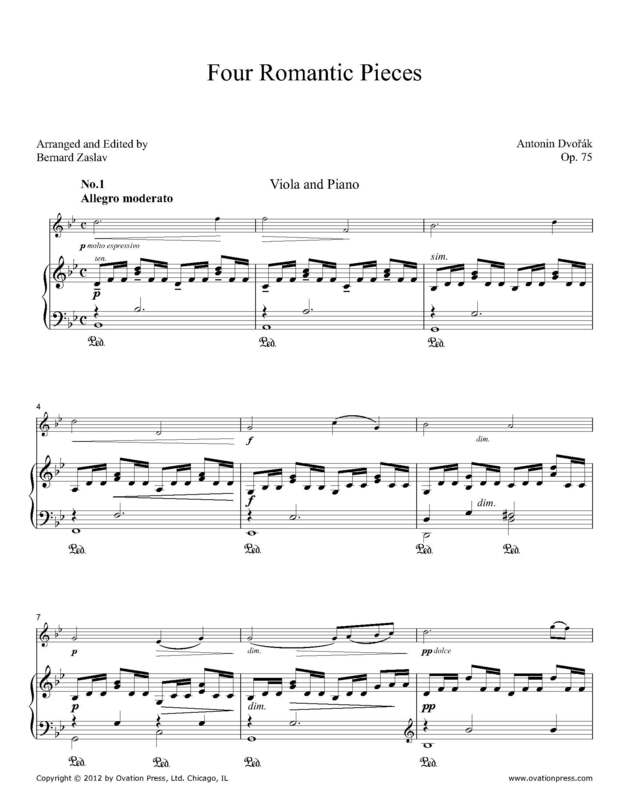 Almost immediately after finishing these four Bagatelles, Dvořák decided to give them wider currency by transcribing them for violin and piano, and it was in this form, under the new title Four Romantic Pieces, Op. 75, that they reached print. In the version heard here, Bernard Zaslav restores the viola color that Dvořák originally envisioned in this music. Dvořák considered calling the four pieces “Cavatina,” “Capriccio,” “Romance,” and “Elegy,” but removed the titles before publication – although, in fact, they fit the music superlatively well. The distinguished Dvořák scholar John Clapham, places these pieces “among the most successful of Dvořák’s lighter works.” The first and third are lyric efforts in the major mode, both built on long-lined melodies. In No. 1, a gently buoyant accompaniment rhythm underpins serene meditation, while No. 3 presents a melody of more direct ardor against luminous figuration. The remaining pieces, both in minor mode, are strongly contrasted: bardic folk-like vigor marks the extroverted No. 2, while in the closing piece, a theme of restrained grief based on broken rhythms undergoes a lengthy, rich-textured exfoliation in which impassioned suffering can be glimpsed amid the prevailing sobriety. Dvořák himself was at the piano when the Romantic Pieces were premiered by the violinist Karel Ondrícek on March 30, 1887.